Bel Mare is a luxurious and exclusive gated mid-rise neighborhood set within Riviera Dunes, a 288-acre resort and yacht club on the north shore of the Manatee River in Palmetto, FL, overlooking Bradenton and not far from Sarasota, St. Petersburg and Tampa Bay. Bel Mare’s three luxury 15-story towers offer residents spacious living areas and breathtaking aquatic views. Amenities include tennis, lap pool, a short-game golf course, spa, billiards, theater, business center, walking trails, a beach on a private lake, and an 88-acre safe-harbor deep-water marina with 225 slips. Corvus International hired the Agency to create an image and execute marketing activities for a sales launch at a property with no buildings or amenities in place. Within 60 days, we created the “Bel More” campaign, emphasizing the active and luxurious lifestyle. We targeted Baby Boomers, many of whom would want to purchase a home for retirement or vacationing. 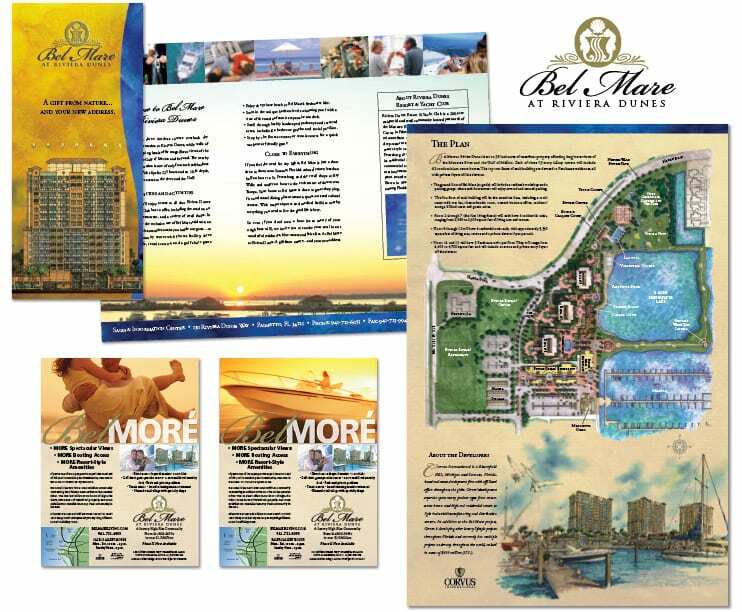 The campaign included print ads and an over-sized, elegant brochure to complement Bel Mare’s high level of design and sophistication. We also designed and fabricated a sales and information center, and held a grand opening event on site. Our marketing, advertising and public relations efforts all came together within a short timeframe to create the vision and excitement about the project. For the event, there were so many interested parties that we had to hold a lottery. Prospects picked a number, with the higher numbers offering buyers the opportunity to select a specific home. All three buildings sold. Bel Mare’s success paved the way for Corvus International to continue its community development efforts in Florida.